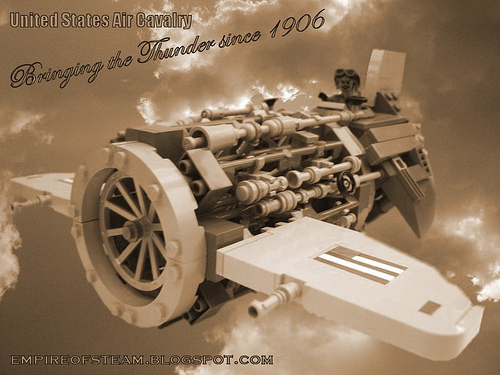 A good amount of my day yesterday was spent talking about the US Air Force and LEGO steampunk with a cousin-in-law who is coming out of his dark ages. So it seemed fortuitous that Rod Gillies (2 Much Caffeine) posted pictures of his steam jet powered P2 Thunderbolt of the US Air Cavalry, circa 1906. Hey mate, thanks very much for the feature. It is much appreciated. Glad you like this, it’s my first steamy MOC for a while: I had a bit of “steampunk block”.